Tips & Trends > Uncategorized > “No Ragrets”: How Much Does Tattoo Removal Hurt? It’s not as bad as ‘no ragrets,’ but you still need your tattoo lasered off. So how much does tattoo removal hurt? Here’s everything you need to know. About one-third of people who have gotten tattoos say that they regret at least some of their ink. We know you’re curious about what getting a tattoo removed takes. You want to know how many sessions you can expect to have, what the recovery process will look like, and even how much cash you’ll need to shell out in order to get rid of your mistake. Your tattoos might make you look cool, but the truth is that you’re a bit nervous about the potential pain associated with your treatments. 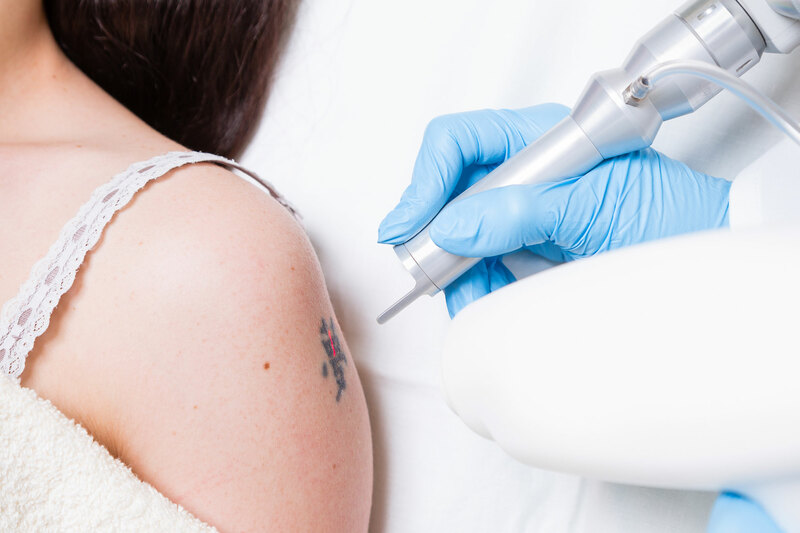 In this post, you’ll learn exactly what to expect out of the laser tattoo removal process. We’ll also let you know how our services will give you the results you’ve dreamed of. While we know that getting a tattoo certainly requires you to withstand a bit of pain, many people are concerned that the won’t be able to handle the pain of tattoo removal. Though it might not exactly be the most comfortable experience in the world, there are now less painful options when it comes to how to remove a tattoo. PicoWay laser is more effective at getting rid of your ink with less pain associated with traditional lasers. This is because it actually sends energy to the targeted area incredibly quickly – we’re talking about one trillionth of a second here. Because the laser pulses are much shorter than traditional lasers, you’ll experience much less pain. Plus, a topical numbing agent will also be used on your skin, to manage the pain even more. The laser actually works by breaking up the ink in the tattoo into tiny particles, which are then removed naturally through the body. The PicoWay laser works on a variety of tattoos and skin types, from multicolored ink to pigmented lesions. Depending on the size and colors of your tattoo, you may need to come in for a few laser sessions to get it removed completely. Still, the PicoWay laser has been proven to require fewer sessions to completely remove the tattoo than traditional lasers. Additionally, the PicoWay laser has an incredibly low risk for scarring after the procedure. Because the tissue in the area surrounding the tattoo is impacted by the laser, scarring can often be a concern when traditional lasers are used. Though scarring can still happen depending on your skin type, even if it does, it will be much less noticeable than in standard tattoo removal procedures. We know that you likely also have questions about how you can fund your tattoo removal. Many people feel as though, although they’d love to be able to erase their ink, the can’t afford the costs associated with multiple tattoo removal sessions. We understand that your goal is to remove your tattoo completely, not just fade it slightly. So, we offer a unique flat fee pricing model when it comes to our tattoo removal services. Unlike other tattoo removal services, we won’t hit you with any hidden fees or increase the costs of multiple removal sessions. Instead, you’ll pay just one flat fee, and we’ll keep working with you until your tattoo has disappeared completely. We come up with that fee based on how large your tattoo is, where it’s located, and the colors used in your design. Many different factors can impact the removal process, so make sure that you speak with a professional about what you can expect based on your unique tattoo. We want to be sure that you have as much information as possible before you decide to get your tattoo removed. Now that you have a better understanding of the potential pain associated with your treatment, let’s talk about proper aftercare. Immediately after the session is finished, you should expect to see redness around the area where the lasers worked. In general, this should only last for a few hours after your treatment. If you have an event or just don’t like the look of the redness, it’s safe to use makeup on the area. Later on, the area around the tattoo will actually turn a whitish color. You may also experience a continued bit of redness, in addition to mild swelling. This is all normal. You and your team will come up with a specific aftercare plan for your needs after your session is finished. Make sure that you follow their instructions to the letter to ensure that everything heals as it should. Now that you have a better understanding of the potential pain, what you should expect after the session, and even how our pricing system for tattoo removal works? It’s time for you to book your initial consultation. You don’t have to spend the rest of your life walking around with a tattoo you seriously regret. There are affordable and less painful options available to you when it comes to tattoo removal. Ready to get started on erasing your mistake? If so, then reach out to us today to learn more about how we can help you.